Welcome to the Lincoln PMC Kids Ride! Join the fun, rain or shine on Sunday, May 12th! 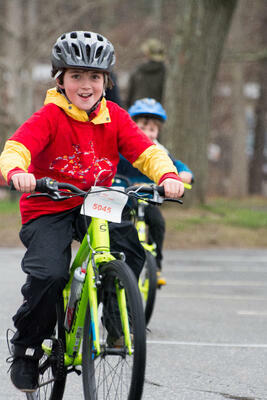 Kids of all ages find fun, camaraderie and inspiration in bringing us closer by the mile to the cure for cancer. The program engages youth in philanthropy, instills the value of working for the benefit of others and promotes physical activity. The Lincoln PMC Kids Ride offers children, parents and neighbors an opportunity to work together in the fight against cancer! 8:30 - 9:15 am – RIDE! 9:30 - 10:30 am – Celebration! Music, dance party, bouncy house, snacks, activities, and more! Wally's Way/Tyke Loop: Easy and fun loop around "The Village" - in front of the Brooks Gym for the youngest riders on tricycles, bicycles with training wheels and balance bikes. Children can ride this loop once or several times! A parent is required to remain at the loop to supervise and cheer on their rider. The Green Monster/Big Kids Loop: A 2-mile loop around the school center green. Ride it once or several times! No training wheels will be allowed on this loop. '47 supports the 2019 PMC Kids Rides program. Riders who register for the Lincoln PMC Kids Ride and pay a $20 registration fee will receive a $20 coupon to the Jersey St. store (19 Jersey St., Boston, MA) in their registration packet. Certain restrictions apply, coupons expire December 31, 2019). The Lincoln PMC Kids Ride relies on local sponsors to help keep costs low and so that the PMC can continue to donate 100 percent of every rider-raised dollar directly to Dana-Farber Cancer Institute. Sponsorship will show your support of the community and the fight against cancer, as well as enable you to gain valuable exposure across Lincoln. If you or your company are interested in becoming a sponsor or to donate items (pizza, ice cream, snacks, sporting tickets, gift cards, baskets, etc) please click on the button below below.